Minute Man Group and Orion Group are central groups of Shoshone Basin east of the creek. The shallow pool SMMGNN001 marks the junction between Little Giant Group in the north and Minute Man Group in the south. 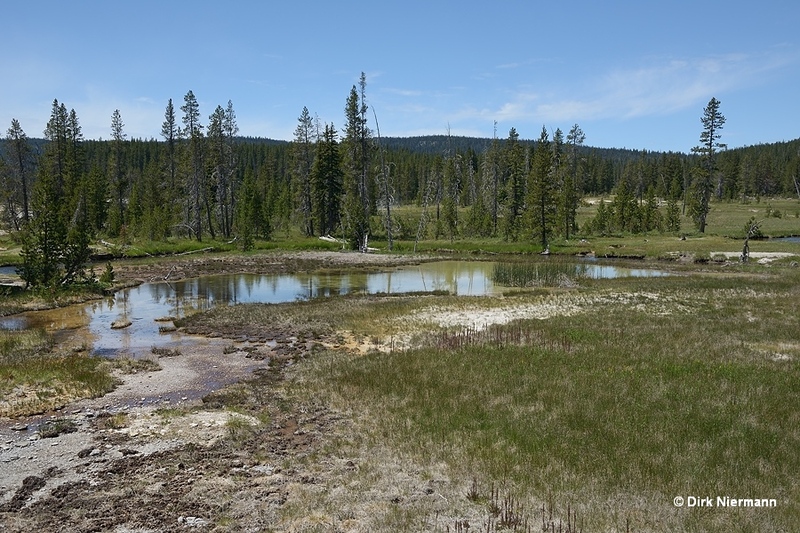 Grass patches and rushes indicate that the pool possesses only moderate temperatures. 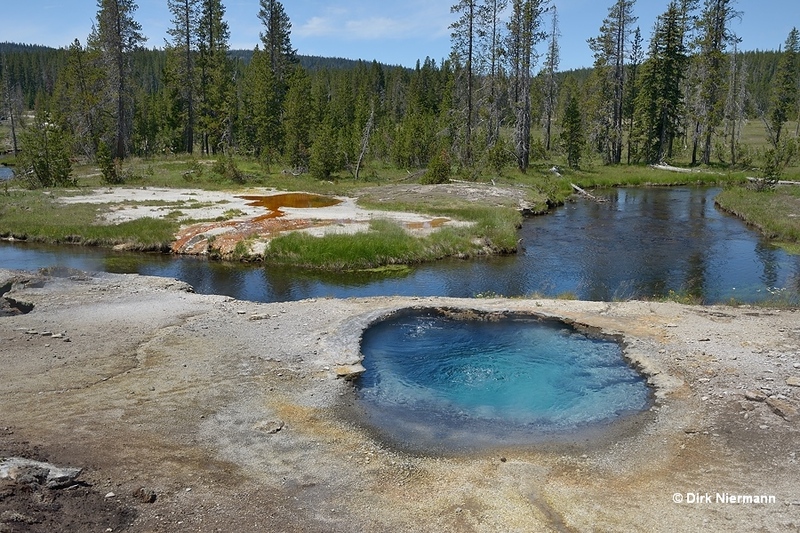 The gorgeous blue pool SMMGNN014 on the bank of Shoshone Creek is a favored photo motif for most visitors. But the picturesque sight hides a nightmarish mystery. 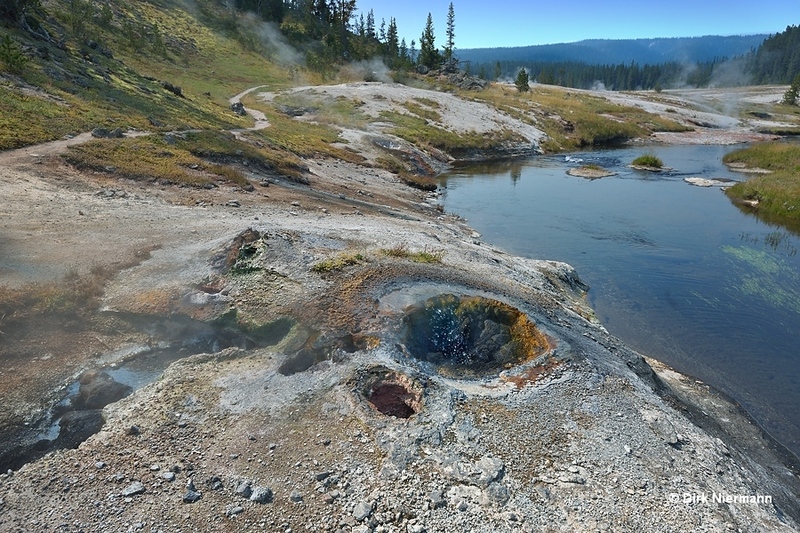 In February 1988 a 24-year-old camper left his group in the evening to explore the snow-covered geyser basin alone. At nightfall a heavy snow storm set in and somehow the young man, a park employee from Alabama, wandered from the trail and fell into the 84 °C (183 °F) hot spring. He managed to get out of the pool by his own efforts and walked back to his companions. Due to the adverse weather conditions there was no chance to gain any medical aid in time or to bring him back quickly, so he died the next morning in his tent on the shore of Shoshone Lake. 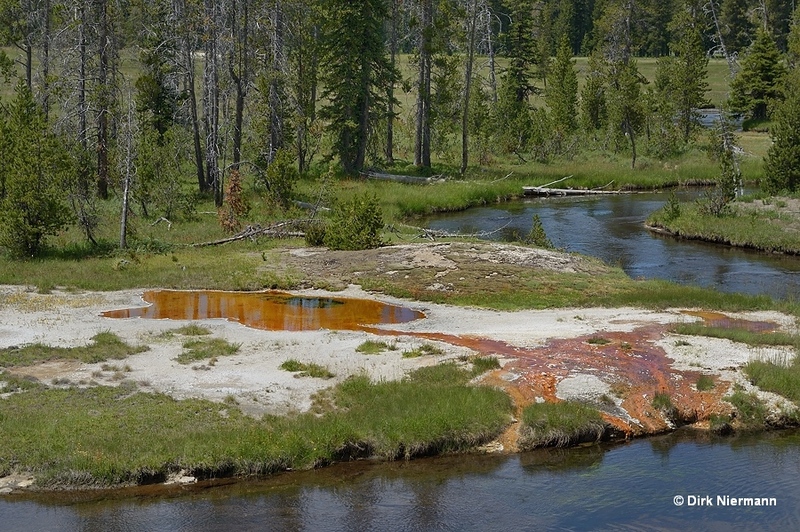 Rangers later detected some of his belongings floating inside SMMGNN014, others were lying outside near the spring's rim. Across the river from SMMGNN014 the bright orange spring SMMGNN072 can be observed. 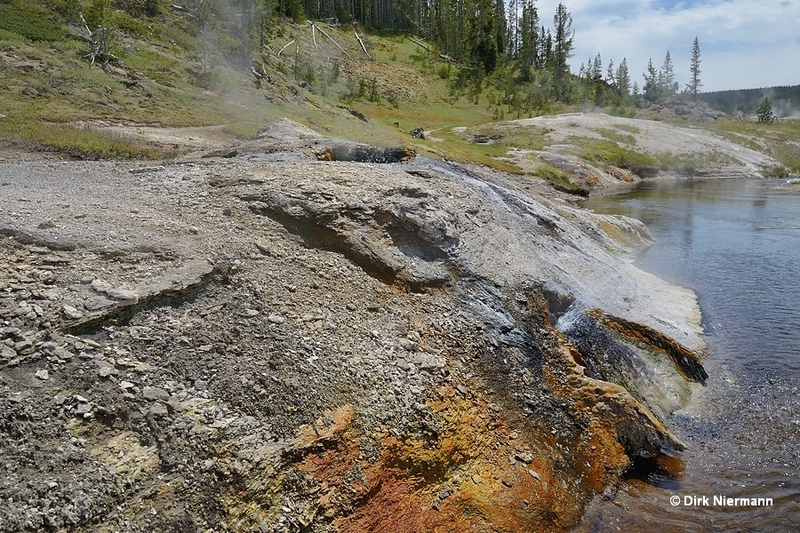 A few feet downstream from SMMGNN014 a cluster of hot springs and spouters appears. 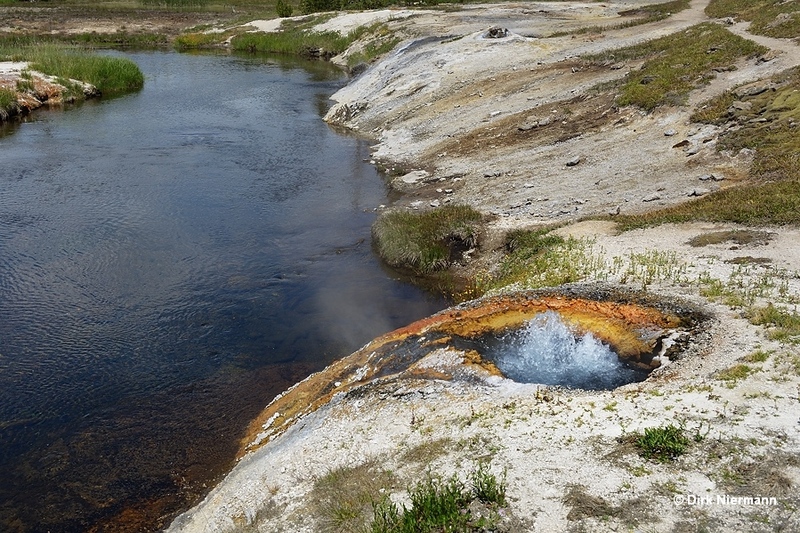 Most prominent among them is the perpetual spouter Black Sulphur Spring, but also its neighbors SMMGNN019 and SMMGNN016 are worth a closer look. On the steep flank of the river bank below Black Sulphur Spring SMMGNN015 permanently spouts a tiny water jet into Shoshone Creek. 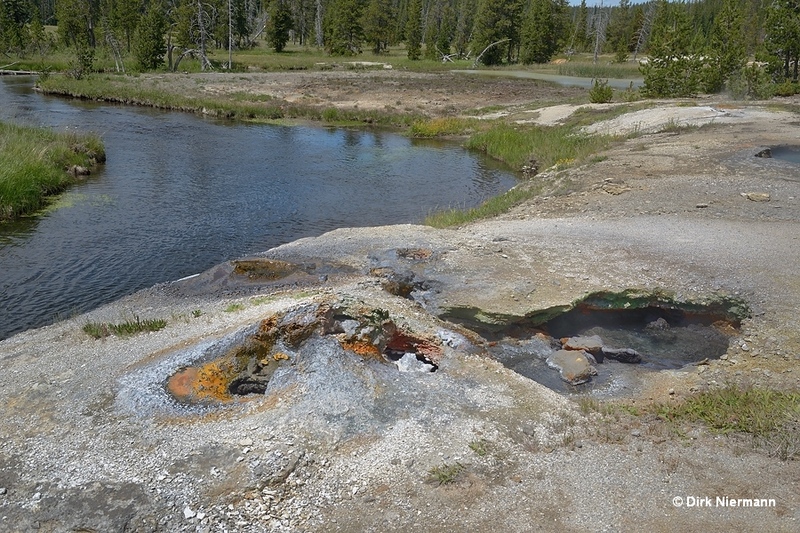 In contrast to the RCN database T. Scott Bryan describes this spouter as Black Sulphur Spring or at least a part of it. Another perpetual spouter resembling Black Sulphur Spring follows a short distance to the south. After passing SMMGNN022 the trail climbs the sinter mound of Soap Kettle. 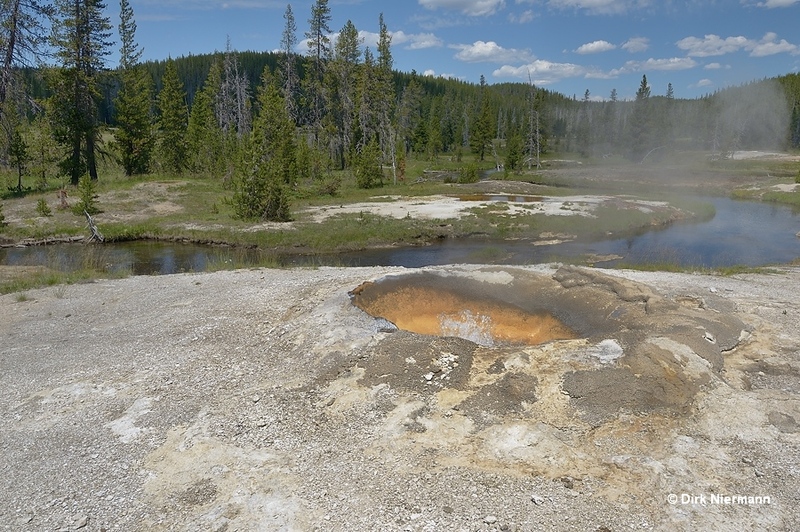 At the base of the mound a small geyser shows up. 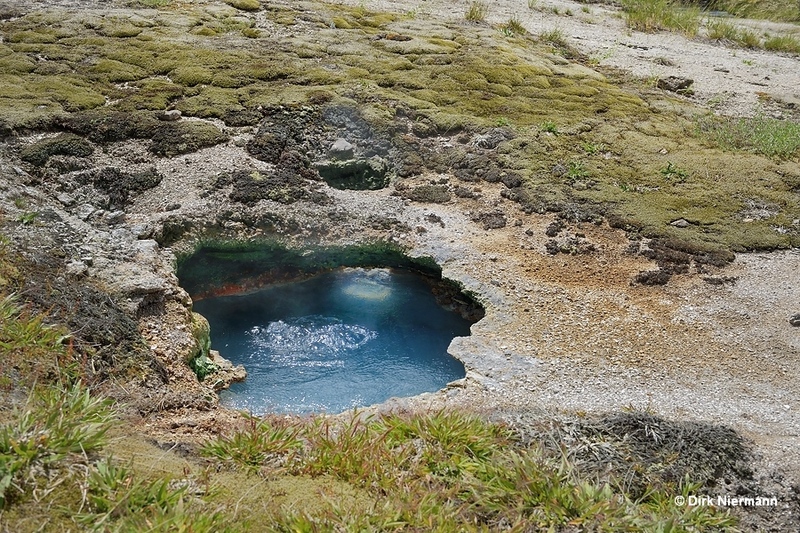 Skylight Geyser (UNNG-SHO-10, SMMGNN025) is a unique feature. Located in a small cave, skylight falls through a hole in the ceiling onto the water surface. Spouting is nearly constant but only less than one foot high. Soap Kettle on top of the sinter mound was a very regular geyser with intervals between 6 and 30 minutes. Unfortunately, Soap Kettle has been rarely active in the 2000s, showing most of the time only gentle splashing with no overflow.